Some of North Bend’s most discriminating taste testers gathered at Gambino’s Pizza Sunday to try six experimental pies. 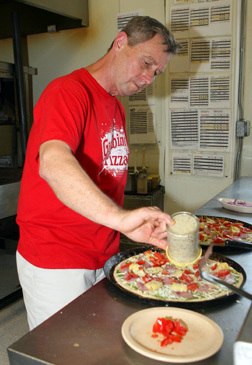 North Bend Gambino's co-owner Ed Gray puts the finishing touches on one of the new pizza recipes being tested in North Bend. The event was a part of Gambino’s Taste of Italy program, an effort to get the public’s opinion on six pizzas that may eventually become permanent menu additions in all Gambino’s restaurants. The chain has 55 locations in a five-state area stretching from Nebraska to Texas. The new crust, which features oregano and Parmesan cheese, is only available with the six Taste of Italy pizzas. The next step was to take the new flavors to the public. The North Bend location is one of just six Gambino’s restaurants that will test market the six new pizzas during the month of June. Sunday’s test was the beginning of that process. Taste testers were asked to rate each pizza on a scale of 1-5 in 10 categories: presentation, temperature, portion, value perception, taste, seasoning, doneness, sauce, toppings and crust. Ed Gray said one of the favorite pizzas of the group was the Siciliana, a spicy pizza with sliced Italian sausage, pepperoni and caramelized onion. Another favorite— and the only one that the taste testers completely devoured— was the Sei Formaggi, a cheese pizza featuring Alfredo sauce, roasted garlic and five types of cheese. The six experimental pizzas will be available for the rest of the month in medium size only. Ed Gray said it was fun to get in on the ground floor on innovation within the company. If the trial run is successful, the new pizzas will be added to the menu company-wide in the fall.